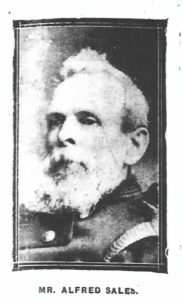 On 2 March 1928, the Courier reported the death of Leigh’s oldest resident, Alfred Sales. (Full Courier article in our Archives). He had passed away on Sunday 26 February, at the advanced age of 91 years. Alfred became an engineer and served his apprenticeship with Messrs Owens of Whitefriars. However, as a young man he joined the Royal Navy and saw active service in Chinese waters, for which he received the 1857 Canton Medal and Bar. He visited almost every part of the globe and on returning to England he lived and worked in London for many years in the Camberwell area, with his wife, Ann, and their many children but by 1891 the family settled back in his native village to take up the position of engineer to the late Mr Samuel Morley MP and continued this service under Lord Hollenden. Mr Sales was one of the pioneers of the Leigh Fire Brigade (which was established in 1882), first acting as Engineer for many years and afterwards as Captain. After he retired, he retained his connection with the Brigade as a Vice President. Alfred was described as quiet and retiring and one who always put duty first. The funeral took place on Wednesday 29 February in the Leigh churchyard, the Rev. F L W Sealy officiating. He was accorded a Fire Brigade funeral, members of the Brigade and Second Officer Fred Faircloth being in attendance, while four firemen acted as bearers. The coffin was followed by his sons and daughters, nieces and grandchildren and a number of friends. Many beautiful wreaths were sent, including one from Lord and Lady Hollenden, the Leigh Fire Brigade, Mr S M Knight, Mr G H Boby, Mr and Mrs A Stubbings, Mrs J A Worthington, Miss F Sales (Hastings) and members of the family.